''A GEM OF A NEW HOTEL'', the Embassy Suites Mexico City - Reforma hotel is located in the heart of the financial, business, government and cultural center. This gran turismo boutique hotel provides an ideal setting for business and leisure travelers alike. The hotel is a contemporary and intimate style Embassy Suites with unparalleled, personalized service for today's most discerning international guests. Its exterior is covered with a magnificent fa e made up of 1,982 pieces of glass reflecting the excitement and diversity of Mexico City. The furnishings are modern yet emulates our Mexican heritage. The Embassy Suites Mexico City - Reforma hotel's entrance on the famous Reforma Avenue leads to two winding staircases for access to the first floor reception area where guests can relax in a lobby lounge or enter the breakfast and manager's reception area. A Starbucks cafe and a full service restaurant called Evita, serving Argentinean cuisine, are on the ground floor. The pool and exercise room are located in the basement level. A business center is open round-the-clock. Guest floor elevators can only be accessed by guest suite keycards. 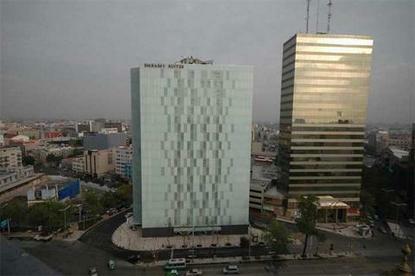 Within walking distance to the Embassy Suites Mexico City - Reforma hotel is: The Bellas Artes Theater and Museum. The Museum of the Revolution, telling the story of Mexico's fight for independence. The 'Glorieta' or Statue of Christopher Columbus by the French sculptor Cordier. West on the Reforma, guests have views of Chapultepec Castle as it stands over the city from its place in Chapultepec Park. Chapultepec Park is also home to the Museum of Anthropology with its collection of artifacts from the different civilizations that inhabited Mexico.Once inside, you'll notice we have designed every detail to make staying with us the most pleasurable experience. This is the new Embassy Suites Mexico City - Reforma hotel, the boutique hotel for today's most discerning international guest.